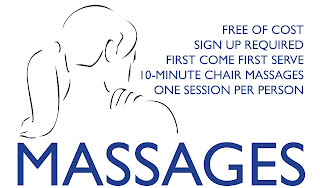 Atelier is bringing in Chair Massages for all current BAC students, free of cost, on Saturday, November 30 from 5-8 pm and Saturday December 7 from 5-8 pm! Sign ups will begin at 4:45 pm on both days in Cascieri Hall. Massages are in 10-minute intervals, and the massages are first come, first serve, with a maximum of one session per person.